Another dock bites the dust! This dock looked great from the top. Deck boards were in good shape and they thought they were just going to get a wash and deck boards stained. Dock and decks dove the pilings and found 17 of their pilings had shipworms and needed replacement. Orange Beach, Gulf Shores, Foley, Elberta, Perdido Bay and surrounding areas are being severely affected by the worm epidemic. Worms are eating the newer pilings in record time. 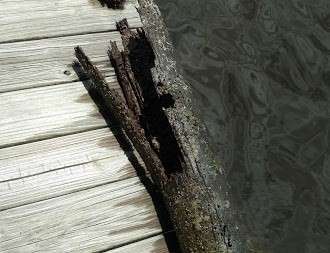 Dock and decks has techniques to repair partially damaged pilings. We can also drive new pilings or walk pilings under the roof if necessary. This dock should not have had this much damage in 5 years. We suggest a piling wrap to protect the pilings you have left. We can dive your pilings and give you a full inspection report in order to make the necessary repairs and protect the pilings that are still in good shape. .Give us a call today for free estimate. Dock and Decks Marine Contractor for all of Baldwin County including Gulf Shores, Foley, Orange Beach, Perdido Bay, Fairhope, Daphne and Elberta – Building the Best Fixing the Rest! Share the post "Deck Builder Gulf Shores, Foley, Elberta, Fairhope, Orange Beach"